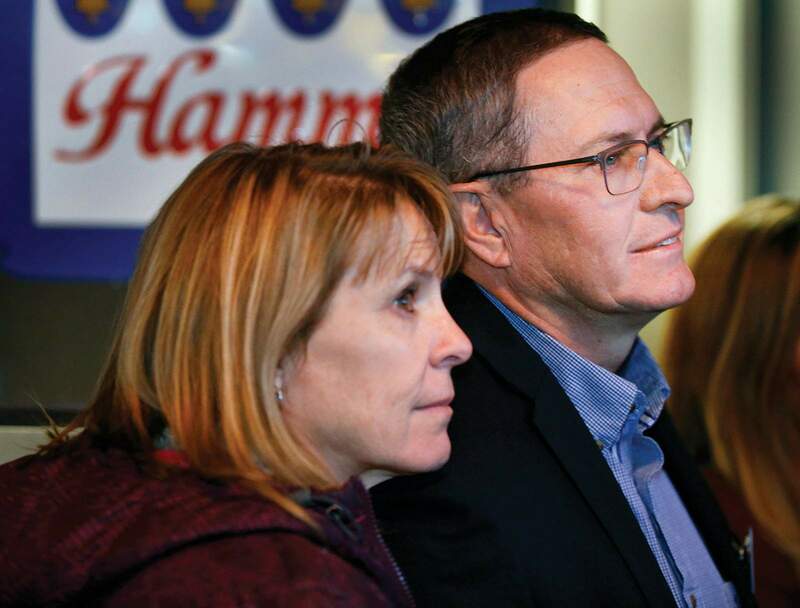 Brad Blake, La Plata County commissioner in District 1, watches election results with his wife, Janelle Blake, on Tuesday night during a Republican viewing party at the Rusty Shovel Saloon. 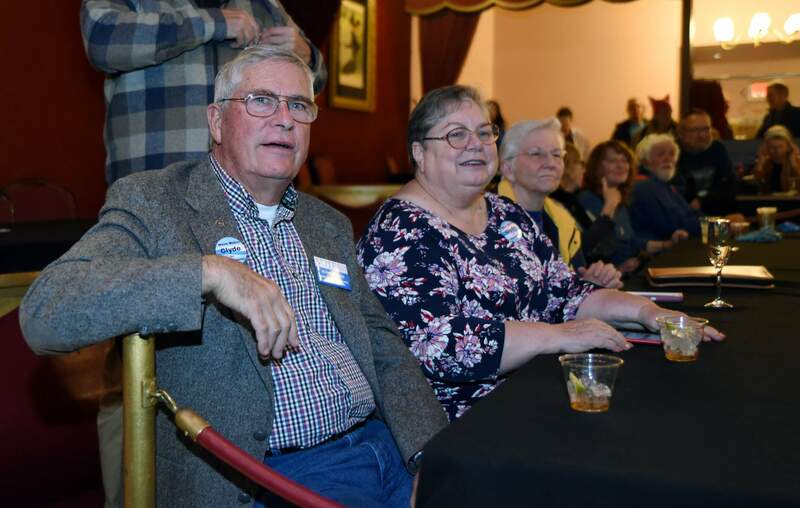 Clyde Church and his wife, Paulette Church, watch election results come in Tuesday night during the La Plata County Democrats’ party at the Strater Hotel. 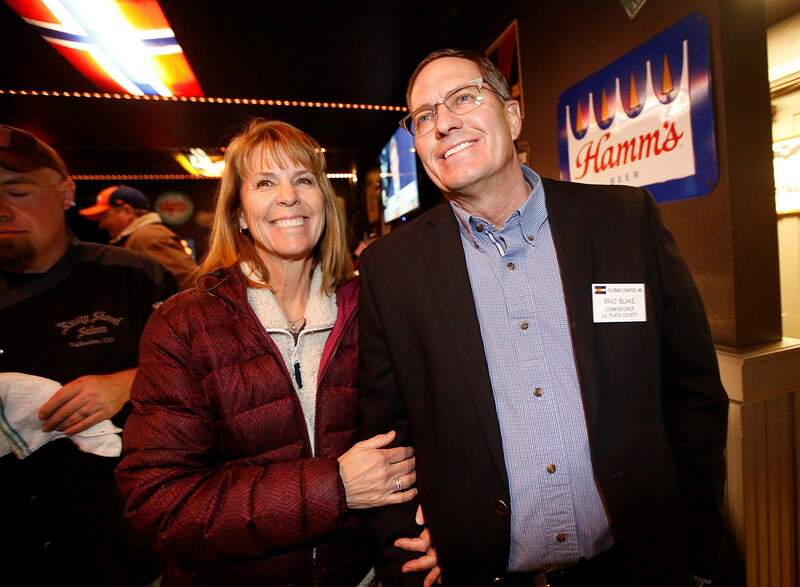 After final voting results filtered in early Wednesday, incumbent La Plata County Commissioner Brad Blake appears to have retained his seat representing District 1. With about 28,500 votes counted as of 12:12 a.m., the sitting Republican commissioner had 50.09 percent of the vote, or 13,725. Opponent Clyde Church, a Democrat, had 49.91 percent of the vote, or 13,678. The unofficial results show Blake won by 47 votes. Church said early Wednesday morning he’s still hopeful. Blake and Church ran a cordial campaign this election, absent of attacks or harsh criticism. Instead, both shared similar goals for the county, though their preferred methods differed at times. Blake, for his part, said he left the tea party years ago when infighting began. And, he touted a four-year track record of working well with the two other commissioners on the board, both Democrats. Church also called Blake a climate-change denier. Blake, refuted the allegation, saying he believes the climate is changing, but the jury is out as to how much humans are responsible. Despite the infrequent back and forth, the candidates agreed that battling La Plata County’s dwindling budget and addressing a much needed update to its land-use code will be the biggest challenges for the winner of this year’s race. For years, La Plata County’s operating budget has been on the decline as oil and gas property tax revenues fall. Budget cuts have forced the county to make tough decision about where to cut services. Blake said in a previous interview it may be necessary to ask voters again for a modest tax increase to help services, such as road and bridge improvements. Church reiterated similar sentiments, and he said there should be a greater effort to include the public in the decision making about what services should be cut if voters refuse a tax increase. If re-elected, it would be Blake’s final term as commissioner. He runs a real estate company that owns and manages rentals. He also owns Blake Mechanical, a mechanical and plumbing service, which is run by his wife and son. Church moved to Durango in 1999 after working for decades in the technology and business field, working for Sperry Defense Systems, Metalcraft, as well as Iowa State University’s College of Engineering. He is now retired and lives in the Falls Creek area.